I’ve learned in my (short three years) experience as a mother, that I have to be intentional in training, teaching and disciplining my children. None of these things happen naturally and it takes extra thought and effort on my part to incorporate them into my day. Just like I have to be intentional about my relationship with Jesus, I also have to be intentional about teaching Walker & Kennedy about Jesus and I don’t think it’s ever too early too start! My biggest task as a parent is to disciple my children as followers of Christ and I thought I would share with you all the simple little things I do to help them in their walk with the Lord. 2. Play Uplifting Music – I play instrumental hymns and praise music throughout the week. It relaxes us all. My favorite stations on Pandora are Amazing Grace (Instrumental Hymns), Watermark and The Praise Baby Collection. I’ve also heard great things about Seeds Family Worship which is a company that puts scripture to music in a kid friendly way. Plus I’ve been listening to Abiding Radio lately which streams uplifting instrumental music for free and they even have a kids station! 3. Read Christian Based Board Books – We have several bible story board books and a toddler bible that Walker loves to read. We’ve also started reading a short devotional every night from a book called, Big Thoughts for Little People by Kenneth N. Taylor. I love this book because it goes through each letter of the alphabet and describes a character quality such as Kindness or Patience and it gives a bible verse to go along with it. It’s an older book that I found secondhand, but you could probably find it online if your interested. 4. Sing Hymns and Children’s Songs – I normally find myself singing praise songs as I’m doing my morning chores and Walker loves to hear anyone sing! What toddler doesn’t shake their little booty when they hear music? We also try to sing “Jesus Loves Me” before bed each night. 5. Read Scripture Aloud as a Family – Okay I admit, we don’t do this very often, but it would be a great thing to build into our days! 6. Watch Christian Based DVDS – I love the Praise Baby DVDs! They are mostly slow and calming which I love and I often find myself singing along. I plan on purchasing more soon. Veggie tales is also a great option for teaching bible stories and character qualities. 7. Be Intentional about Holidays – Christmas and Easter are great times to teach little ones about Christ. It’s easy to get caught up in the food and celebration of the holiday, but take some time to intentionally teach your child about the true meaning of those special times. 8. Recite Memory verses – Our church sends home a coloring & activity page every week that goes along with the lesson that they learned in class. On it they have a monthly memory verse with sign language that Walker LOVES to do! See if your church has any resources for toddler scripture memorization or pick a short verse and repeat it over and over encouraging your child to do the same. 9. Set a Good Example! – It will be hard to pass Christian values and beliefs onto your child if your not living them out yourself. “Your actions speak so loud that I can’t hear what you say.” Act the way your want your child to act and they will respond more positively to your teaching. 10. Love them & give them Grace! – I think it’s so important as parents to love our children unconditionally and to give them daily grace! After all, this is what Christ does for us! I don’t do all of these perfectly each day, but I do try to at least do some of them consistently. It is so important to guide our little babies hearts towards the Lord and I pray that I am doing that well at this stage in our lives. 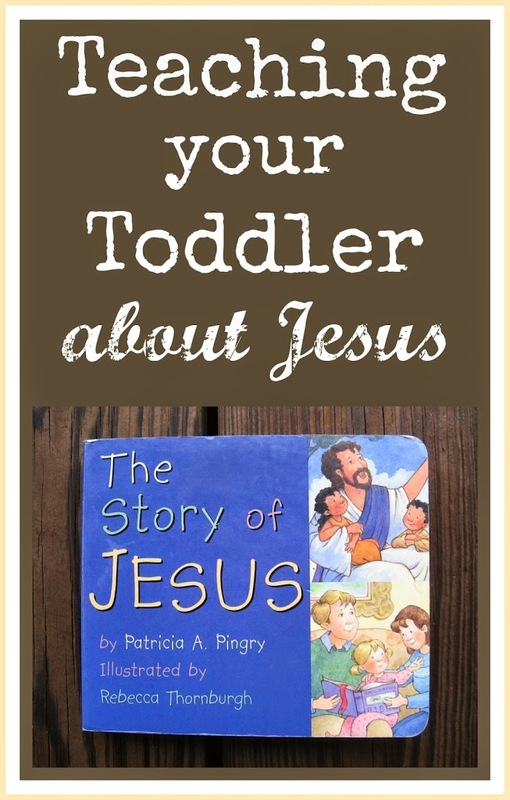 What do you do to teach your young children about Jesus? Hello! I found your blog via the Modest Mom linkup! I have a 3 1/2 y/o and 1 y/o boy, and have found your suggestions to be so true and so vitally important! It's so important to make an effort to teach our little ones every day in simple ways. It is so very important to plant the Bible verses in our children. As they get older and go through tough times hopefully they will remember all of the verses and praying that we did with them. Thank you for reminding me how important this is each day.